Jamal Wingo (Arthur Reggie III) was a young boy living in South Central Los Angeles with his father (George L. Wallace) and grandparents (Dawnn Lewis & Darryl Sirvad). One day, Jamal was encouraged to start growing up and give up some of his childish things, including his teddy bear, the sunglasses and baggy pants wearing C-Bear (rapper Tone Loc). But, C-Bear magically came to life and ended up becoming Jamal’s best friend. C-Bear was able to help Jamal deal with important life lessons by taking him on magical fantasy adventures as well as show him he didn’t need to lose his youthful outlook in order to grow up. Of course, the sarcastic bear was far from perfect and sometimes landed Jamal in just as much trouble as he would himself before helping to turn it all around. C-Bear and Jamal having a pillow fight. The series was created by Earl Richey Jones and Todd R. Jones with Franklyn Ajaye and Barry Douglas, taking inspiration from Loc’s childhood and his own fantasy adventures he would have with a teddy bear. Loc also served as an executive producer, along with Phil Roman of Film Roman and Fox Kids’ Margaret Loesch, and provided the vocals and lyrics for the show’s theme. Kurt Farquhar composed the rest of the series’ music, each episode featuring one musical number in relation to the plot and lesson. Film Roman and Loc brought the series to the attention of FOX Children’s Television executive Roland Poindexter who was not only attracted to the series because of Loc, but also because it allowed them to tell good stories from the little-seen perspective of an African American youth. 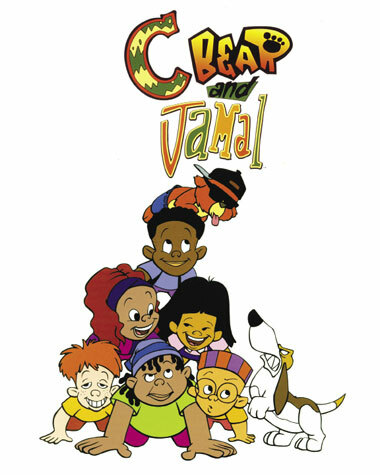 The kid cast: C-Bear, Jamal, Maya, Kim, Chipster, Big Chill, Kwame and Sooner. Care was taken to preserve the authenticity of the series. Rather than keeping the cast limited to one particular race or culture, the producers chose to adequately represent the Los Angeles population with the mix of people that actually resided there. This was best represented in the form of Jamal’s human friends. Amongst them were Maya (Kim Fields Freeman), who was a very loud and opinionated, although extremely smart, African American girl; Big Chill, a large chubby kid who was always hungry and introduced himself with the phrase “the b-i-g c-h-i-double l is in the hizouse”; Kwame (both Aries Spears), an Afrocentric kid who wore African clothing and often found conspiracies by “the Man” whenever he was displeased with circumstances; Chipster (Jeannie Elias), their odd white friend who enjoys making others laugh; Kim (Margaret Cho), Jamal’s Korean friend and Maya’s best friend; and Javier (Paul Rodriguez), Jamal’s Hispanic friend. The show debuted on February 3, 1996 as part of the Fox Kids block for an abbreviated first season before returning that September. The series was a hit with parents and teachers for the topics it dealt with and the lessons it provided. Although there was a healthy dose of slapstick comedy featured in C-Bear’s ongoing battle with family dog Sooner (Danny Mann) and grandma having access to some unusual items from out of nowhere, the producers made sure that the adults, while quirky, were presented as good role models and equally important to helping Jamal’s development as C-Bear. Likewise, scenes at school were done in a respectful manner to emphasize the importance of education and ensured the teacher was invested in the development of the students. The series was a likely candidate for a renewal, but internal politics ultimately led to its demise. Saban Entertainment had acquired Fox Kids and wanted to put a greater focus on programs produced in-house; meaning all outside programming had to go in order to make room for Saban-produced shows (a similar occurrence happened after Disney purchased ABC). 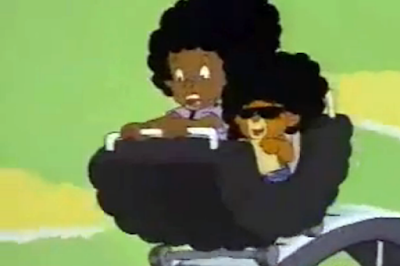 That included C-Bear and Jamal, amongst other family-favorite programs. Xenon Entertainment Group released three VHS collections with three episodes each in the early 2000s. They later combined them into a single DVD release. Starz Media currently has the rights to the show, however Urban Movie Channel offers it for streaming view through Amazon with a subscription to their channel. “Rip Van Winkle” (2/3/96) – C-Bear takes Jamal to the future to show him what can happen if he keeps sleeping through school. “Emperor’s New Gear” (2/10/96) – Jamal is unhappy with the new clothes his father bought him. “Big” (2/17/96) – On Jamal’s 10th birthday, he decides act like more of a grown-up starting with leaving C-Bear at home. “Teeing Off” (9/21/96) – C-Bear helps Jamal figure out where his true talents lie when he disastrously tries out for the golf team. “The Prince and the Po’ Boy” (9/28/96) – Jamal becomes embarrassed about being middle class when he meets a rich cousin and begins to act more upper crust. “Raging Bully” (10/12/96) – C-Bear helps Jamal better understand the mindset of a bully. “Hanging with Mr. Wingo” (11/2/96) – Jamal loses respect for his father when Jamal discovers his job isn’t as exciting as he once believed. 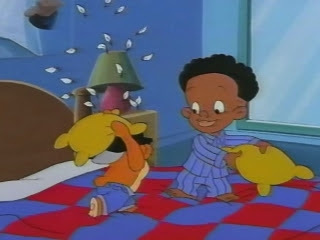 “Big Head Jamal” (11/9/96) – It goes to Jamal’s head when he’s cast in a commercial. “Sleepless in South Central” (11/16/96) – Jamal starts feeling neglected when his father starts daring the attractive mail carrier. “Dumbing Down” (11/23/96) – Jamal convinces Maya she’ll lose all her friends with her better grades and that she should bring herself to their levels. “The Truth and Nothing But the Truth” (2/1/97) – Jamal lies to get onto the school paper, but lies soon become blunt truth. “Puppy Love” (2/15/97) – Jamal wants to ask a girl to the Spring dance and fumbles through various ways to do it. “Most Valuable Grandpa” (2/22/97) – Jamal gains a new respect for his grandfather when he has to replace Jamal’s father at the Parent/Student Picnic. You forgot to add the songs from C-Bear and Jamal episodes! They weren't forgotten. The songs that have been listed in the past were because they were part of that show's central focus. Not yet sure if I'm going to list every song in every show that has a musical number.